My grumpy attitude is NOT Christ-like! I felt abnormally grumpy earlier this week. I have no real explanation. I certainly tried to come up with reasons – the cold, rainy weather, or the impending busy-ness at work, or my own lack of motivation. But none of these things actually explained it. I just felt grumpy. Categories: God at Work, Ministry | Tags: attitude, faith, God, grumpy, Jesus, love, parenting, sacrifice, service, tantrum, Warren Barfield | Permalink. The hope which can overcome any fear! There are so many things in this world to be afraid of: fear of car accidents, fear of pain, fear of losing people we love, fear of failure. It is so easy to get wrapped up in this fear; to let life be led by fear! Categories: God at Work | Tags: evil, faith, fear, God, hope, Jesus, kindergarten, lock-down, parenting, strangers, trust | Permalink. Prayer – special or routine? Sometimes I need to take my own motherly advice. I tell my kids to eat healthy, and then grab fast food for lunch. I stress how important it is to get plenty of sleep, but I am far from reaching that goal myself. When my son is not listening to me (much like an average 6-year-old) I am frustrated and scold him, yet far too often I do not fully listen to what he says to me! Categories: Prayer | Tags: faith, God, kids, kindergarten, love, parenting, prayer, routine | Permalink. 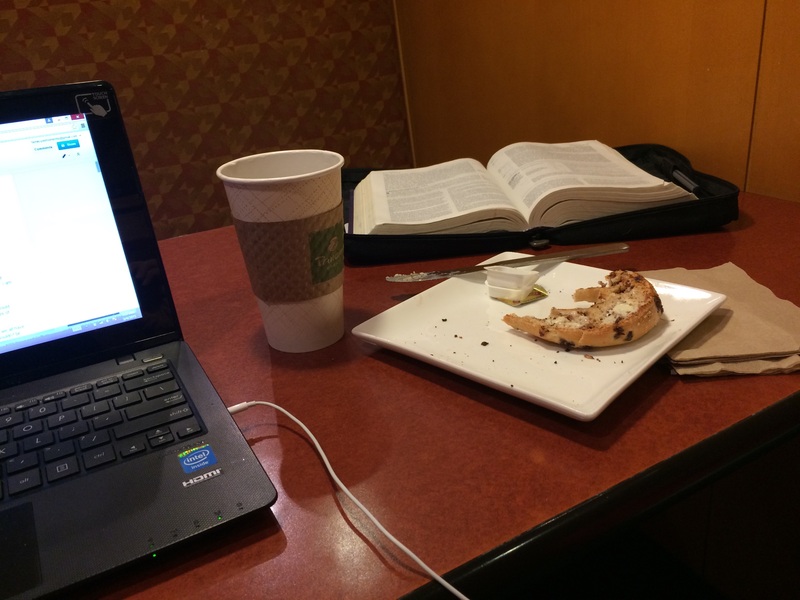 I occasionally sneak over to Panera before work, set myself in a corner with some coffee and maybe a chocolate chip bagel, hook into iTunes, and then spend my time writing, praying, reading scripture and reflecting. I intend to stay for an hour, but it always becomes longer. Then I reluctantly pull myself back into the real world and drag myself to work. Categories: God at Work | Tags: career, faith, God, job, life, patience, purpose, trust, vocation | Permalink. Lessons from my 2-year-old: Sometimes it’s OK to talk to strangers! It seems that not so long ago I was “complaining” about having my 2-year-old in church with me. She does not sit still. She is her noisiest during the quietest moments of the service. It is so very difficult to actually pay attention to a sermon when I feel as if I am there just to corral my 2-year-old. But we have begun to reach the point where she will behave – most of the time – through church. I actually listen to the sermon – most of it, anyway! I had forgotten just how much development happens during the third year of life! Categories: Parenting | Tags: church, faith, God, love, parenting, stranger, toddler, trust, worship | Permalink.